Large ceramic table lamp by Swedish ceramist Carl-Harry Stålhane in collaboration with Finnish designer Aune Laukkanen. 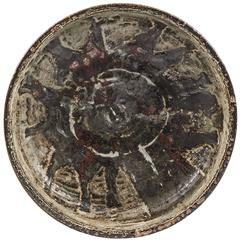 Sweden, circa 1955 Torro Faience-series Possibly a unique piece manufactured by Rörstrand Ab Glazed faience (earthenware) with hand-painted decoration in black, purple and off-white color tones. Newly made sand-colored linen fabric shade 82 H x 43 diameter cm (with shade) 63 H x 13 diameter cm (excluding shade) Marked underside: Rörstrand, Decor Laukkanen, Model Stålhane and model nr. A.5. Literature: Stålhane (Petter Eklund), pg.30-31 (text and images about the Torro Faience series). This table lamp was designed by Carl-Harry Stålhane in his studio Designhuset in Lidköping. Its stone wear with a nice pink/white glaze on top. In good and working condition. A dark green and brown ceramic table lamp by Carl-Harry Stålhane for Rörstrand. Marked by Stålhane and Rörstrand. The measurements stated are of the lamp without the fabric shade. Carl-Harry Stalhane for Designhuset table lamp. Ceramic, patinated brass. Sweden, 1970s. Matte brown hares-fur glazed earthenware ceramic base. The variations of color give this lamp a warm, subtle distinctiveness. "Rorstrand Sweden" original label. 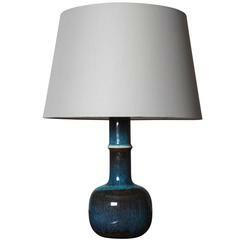 Ceramic table lamp designed by Swedish designer Carl-Harry Stålhane and produced by Rörstrands. Original brown lamp shade. Fully functional.